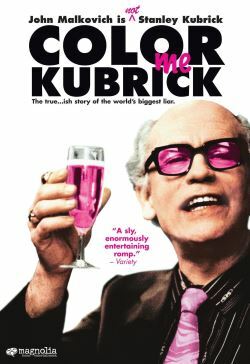 In London in the 1990s, a balding alcoholic with an unsteady American accent introduces himself in pubs and other social settings as Stanley Kubrick. Drinks and meals are suddenly on the house or paid for by an admiring person, usually a man, whose costumes, band, acting abilities or what have you, Stanley finds fascinating. He's actually Alan Conway (1934-1998): we watch him parlay a self-confident manner and a small amount of movie knowledge into a persona whom others immediately hang their dreams on. In exchange, Stanley asks only that they pay the bill. Will he be exposed? Do prosecution and prison await? Or has the National Health something else in mind?